The following blog is based on a presentation given by Marc Limon, URG Executive Director, during the final panel discussion of the 9-10 April Council inter-sessional meeting, held at the Palais des Nations (UN) pursuant to Council resolution 38/18. The Human Rights Council (Council) this week convened a first inter-sessional seminar on how to operationalize its prevention mandate, as set forth in paragraph 5f of GA resolution 60/251. The seminar, the first of three sets of consultations with States and civil society to be held in 2019 (two in Geneva and one in New York), was held pursuant to Council resolution 38/18 adopted last June. It was convened by three eminent experts: Yvette Stevens (chair-rapporteur), Pablo de Greiff (rapporteur) and Nils Muiznieks (rapporteur). Paragraph 5f of GA resolution 60/251 is commonly supposed to have two key elements – namely to ‘contribute towards the prevention of violations,’ and to ‘respond promptly to human rights emergencies.’ However, it actually has three. Paragraph 5f is clear that when exercising this prevention mandate, the Council shall work through ‘cooperation and dialogue’. This is important because it very much goes against the grain of how the Council, and the Commission before it, has tended to address human rights violations. The traditional approach to violations has been, I would argue, two-fold. First, it has tended to be reactive in nature. The Council has tended to wait until a situation has reached a high level of seriousness, often involving gross and systematic violations, before acting. Second, and with some exceptions, that reaction has usually been characterized by public criticism and condemnation – the famous ‘naming and shaming’ – and eventually by the establishment of public investigative and accountability mechanisms. The word ‘public’ is important here, as during the time of the Commission it was used to differentiate these types of public mechanisms from more confidential mechanisms like the 1503 Procedure – now the CCP. This blog makes one central argument, and then seeks to illustrate and apply that argument by looking at the two core elements of the Council’s prevention mandate. The central argument is this: the Council will only be able to effectively implement its prevention mandate under paragraph 5f if States and other stakeholders are willing to shift mind-sets and consider new approaches: i.e. to move from reaction to prevention, and from confrontation to engagement. This does not mean the more traditional approaches to addressing situations of violations are wrong or obsolete. They are not. Where prevention fails, or where a concerned States refuses to engage in meaningful cooperation and dialogue, then other approaches must, of course, continue to be part of the Council’s toolkit, as made clear in other parts of GA resolution 60/251. But it does mean that the Council should be willing to at least try to engage concerned States and regional (and sub-regional) organizations (e.g. African Union, ASEAN, ECOWAS) in processes of dialogue and cooperation, and it does mean the Council should consider supplementing its existing public toolkit with confidential procedures and mechanisms premised on building trust and preventing further violations. What does this mean in practice? How to shift mind-sets and build trust? How to develop new approaches premised on cooperation and dialogue? How to effectively prevent violations and the emergence of crises? This blog will look first at primary prevention – i.e. preventing violations from occurring in the first place, and then at secondary prevention – i.e. preventing the widening or deepening of an emerging crisis via early warning and early engagement. 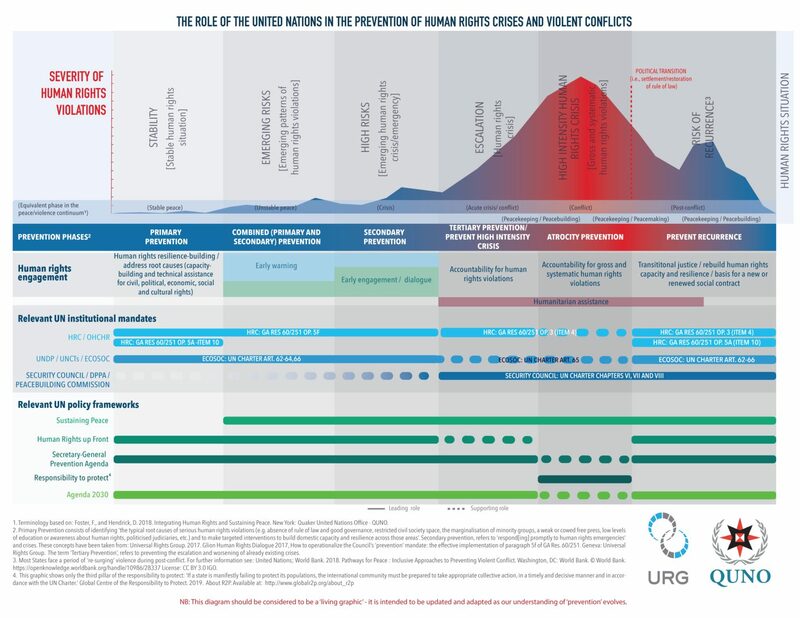 The graphic shown in Figure 1 (above), produced by URG and QUNO, represents a first attempt to fit the Council’s primary and secondary prevention mandates within the UN Secretary-General’s overall ‘prevention agenda,’ and to show how the various UN prevention actions, policies and procedures fit into an overall UN prevention strategy. First then, preventing violations from occurring in the first place means, in essence, working with all States, through cooperation and dialogue, to build national human rights capacity and resilience. It is clear that the Council is – in principle – perfectly placed to play a central role in this area, both in its own regard, but also as part of the Secretary-General’s wider prevention agenda, and through the on-going reforms of the UN’s development system. The key to fulfilling the Council’s primary prevention role is to follow-up on and support the national implementation of States’ international human rights obligations and commitments. In addition to a greater focus on the global human rights ‘implementation agenda’ (i.e. how to promote the domestic implementation, by States, of the recommendations they receive from the Treaty Bodies, UPR and Special Procedures, and link this effort to complementary national strategies to implement the 2030 Agenda for sustainable development), this will require fresh thinking on how to create a ‘space’ for cooperation and dialogue under item 10 (the Council’s agenda item on technical assistance and capacity-building). Within such a space, States would be encouraged to voluntarily provide information on progress with the implementation of UN human rights recommendations, identify implementation gaps or ‘resilience gaps,’ and then request (and have a chance of receiving) technical assistance and capacity-building support to help address those vulnerabilities. In line with GA resolution 60/251, this process must take place at the request of, and in cooperation with, the country concerned. It will also require a willingness to rethink investments in the UN human rights pillar. Developing countries requesting technical assistance from the UN are too often turned away for lack of resources – even though millions of dollars are spent each year in reacting to crises when they occur. From a prevention perspective, this makes little sense. Second, regarding early warning and early engagement; the Council should, I would argue, put in place new processes and mechanisms premised on identifying and responding promptly to emerging patterns of violations, on encouraging cooperation and dialogue with the concerned State and regional (and sub-regional) organisation(s), and on securing and building trust to prevent a worsening of the situation. Existing mechanisms and processes such as the UPR, Special Procedures, Special Sessions, and Commissions of Inquiry simply cannot fulfil this crucial secondary prevention role on their own. It will be important for the Office of the High Commissioner for Human Rights (OHCHR) to strengthen its capacity to receive and rapidly analyse early warning data from across the UN system, as well as from national actors including human rights defenders and NGOs. The goal would be the early identification of emerging patterns of violations. Where such patterns are identified, the High Commissioner should have a clear mandate to bring those situations to Council Members’ urgent attention via confidential briefings. Such briefings might also include reports from relevant actors ‘from the ground’ including NHRIs, human rights defenders, and UN Resident Coordinators. Council members would then need to decide whether, or not, they could usefully contribute to the prevention of a deepening crisis. In making that determination, they might be guided by objective criteria. Where States conclude that they could help, the Council might establish a confidential space for dialogue with the concerned country, and concerned regional (and sub-regional) organisations. This space would be designed to allow members to engage in a meaningful dialogue with the State (and region) concerned, to understand the situation, and to provide counsel (where appropriate). It would also allow the Council to determine if and how it should take further steps to prevent a deterioration of the situation. With the consent of concerned States, the Council may also decide to create and dispatch a ‘Good Offices’ missions to countries (e.g. made up, for example, of members of the Council Bureau, the High Commissioner, or eminent persons from the concerned region), to engage all relevant national stakeholders and leverage preventative diplomacy. Such missions would not necessarily have to end with a formal written report to the Council or a press release.